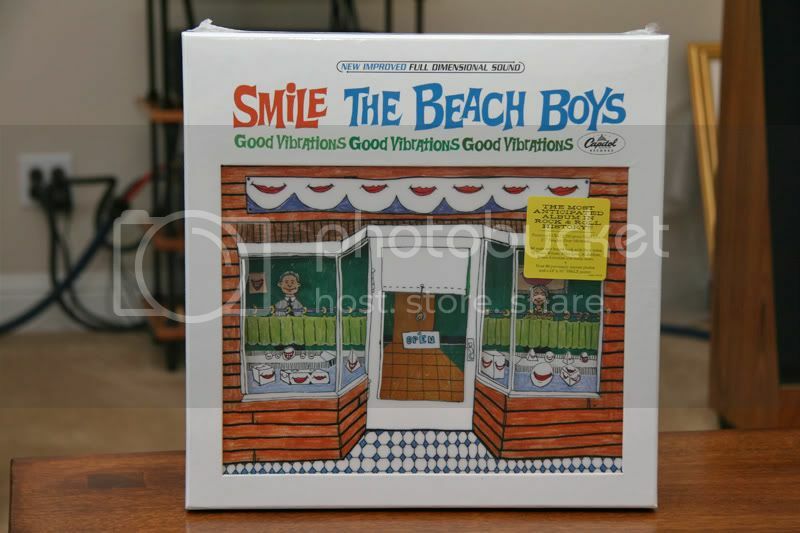 Feel free to discuss the SMiLE Sessions Box Set as a whole; packaging, presentation, and booklet. Thanks for posting this! I wanna hear every detail. really? I'm assuming I have to buy to see? Beautiful. Pictures can't do it justice. the packaging (for the two disc set) is cool..I just wish they had more songs on the second disc since there is about 15 minutes left on it that could have been used ..oh well.. The full box set (CD's, vinyl etc.) is breathtaking. I'm still working my way up to pulling off the shrink wrap - a few more things to do before the day ends. It's 3D and just gorgeous. Coolest box set on the planet. I had no idea it would look like that light up version Brian is showing off. Oh well, the tubes are warming up for a long evening! By far the best box set packaging I've ever seen - the 60 page hardcover book is wonderful, with some awesome color photos. The 45s and LP look perfectly authentic, and I love that they included the original album booklet. Can't rave enough about the packaging from an aesthetics standpoint. Agreed. Can't say enough about the packaging. The box looks like a million bucks. My only gripes involve no backing vocals on the fly-in-less "Barnyard," no instrumental "TOMS/YAMS," not much in the way of "With me Tonight" sessions. This is, by far, the most amazing packaging/artwork i have ever seen for any sort of album/box set release. It's brilliant work. Really, really top notch stuff. It's weird but wonderful that it would be coming at what seems to be the end of the CD era. If the audio portion of the box set had been given the same treatment and care that the packaging received, this would be an absolutely perfect release beyond belief. Take a look at the writing credits. A couple of new names also a mention to Euday Bowman for the "12th St. Rag". The lyrics to "He Gives Speeches" is given credit to Brian. Also posted in the main board. What I am telling my musician friends: this is more fun than I was expecting. The "reconstruction" of the Smile LP is astoundingly well done and the cleaned-up tracks never sounded better. As we know there are some "Free As a Bird" artifacts where things were obviously flown in and pasted (vocal for I'm In Great Shape, the coda to Surf's Up from the 1971 completion, hum-be-dums in GV). Some holes remain (i.e., where there were no lyrics or vocals done for "Do You Like Worms", "Holidays" and "Child"). So it is clearly unfinished but has the "sheen" of a finished structure, that can be played all the way through. The reassembled "Heroes and Villains", "Wind Chimes" and "Vegetables" stand out as audio alchemy at its best. I know some of the scholar types here are wringing their hands at seeing the "duct-taped" parts of the assembly, but at least the thing is a presentable listen, which is the whole point. And Mark and Alan did figure out how to cover that one-beat dead space in the "Wind Chimes" transition: cover the hole with plate reverb! Corny but effective. Also a very "what would Brian do?" move. Package is fun too, interesting there is still a little tension there in the Boys' comments (Mike's a bit defensive, understandably). For those who've bought Frank Holmes' LP slick from him, your print is still a treasure. None of the full-size reprints mimic it exactly, with the duo-phonic stamp, intstead their newly-minted "New Improved Full Dimensional Sound" logo ("sound" instead of "stereo"). The 2-LP vinyl has some nice surprises: I like the really good stereo mixes of H&V and Vegetables, and on the one 45 a stunning reassembly of the "alternate" version of Heroes and Villains, with the "three score and five" lines and the instrumental fade. As far as I can tell this is a recreation of how the fabled "H&V Part I and Part II" single might have turned out. It is the same version included in the 1993 box set but they got a much better source for it. The session track CDs are a longer slog, only getting started on those. Though the vocal rehearsals and runthroughs are fun (Brian saying "you feel the acid kick in?" before "Our Prayer"). The credits and mentions are nice. Susan Lang, Greg Larson, AGD, Bob, and so many others were remembered. Very nice and cool to connect with the fan base and support network so personally. And Mark and Alan did figure out how to cover that one-beat dead space in the "Wind Chimes" transition: cover the hole with plate reverb! Corny but effective. Also a very "what would Brian do?" move. Yeah , but those dead stops were how Brian worked at the time. In fact, they played integral parts in the construction of the "Good Vibrations" and "Heroes & Villains" singles. I don't see why they needed to be covered, unless Brian said that's how he wanted it. 1. When I opened the 3D box lid I saw on the inside the well known picture of the group without Brian, but with Bruce, and the various song titles. Is this an LP? I ask because there was already one in the package that was loose. Were there supposed to be two? If it is one of the LP's, I have no idea how to get it loose from the inside lid. It's really packed in tight. I could pry it out by sticking my finger way down in, but I would most likely ruin the box. Any thoughts, suggestions, etc? 2. I assume that the paper with the track list and picture of the box contents is supposed to work as the back cover? The bottom is folded over, so I can just tuck it in tightly, but then the top part is loose. Should it be put inside the box? I'm not going to tape or glue it if I don't have to. The inside of the lid of the box is just a "for-fun" exact reprint of the abandoned back sleeve. Notice how it mentions being "Duophonic", while the actual LP sleeve says Monophonic. Jesus, jay, don't do it! It's just a reprint!!!! It was my honor that the job of sorting all that session information was given to me, and I achieved that monumental task with a lot of help and guidance from Mr. Boyd. I only wish I'd gotten the "Tag vocals" credit in for the first version of "Wind Chimes" (a mere oversight...but at least I got the recording info for that vocal session in there!). Was the whole package years in the planning? Well I can only speak for sure to my involvement in it, but it was months not years. Really, Tom Recchion at Capitol's art department deserves a HUGE defeaning round of applause for the visual presentation, as much applause as Mark and Alan rightly deserve for the audio components. These guys are heroes, as is Capitol's Director of Catalog A&R, Dennis Wolfe. Quite a team. It helped that Alan, Tom and Dennis are all musicians themselves, and Mark an independent music producer/engineer, so it wasn't just a bunch of "suits" behind the project. 1. The front and back artwork in the box lid are supposed to remain there, so don't mess with it. 2. Lots of box sets (Fleetwood Mac's 1992 box, John Lennon's 1998 and 2010 boxes) come with outer wrapping that's not really designed to fit inside the box, but it should be saved & kept somewhere handy since it's a cool external inventory of the contents. Really, aside from my one little sessionography omission (which bothers me to no small degree), I think the whole package is positively sterling, and I'm glad to see that so many of you think so as well! I'm guessing this will be cherished by music fans for ages to come. The box looks so good I'm using it as a permanent deco element. Like a 3D poster.